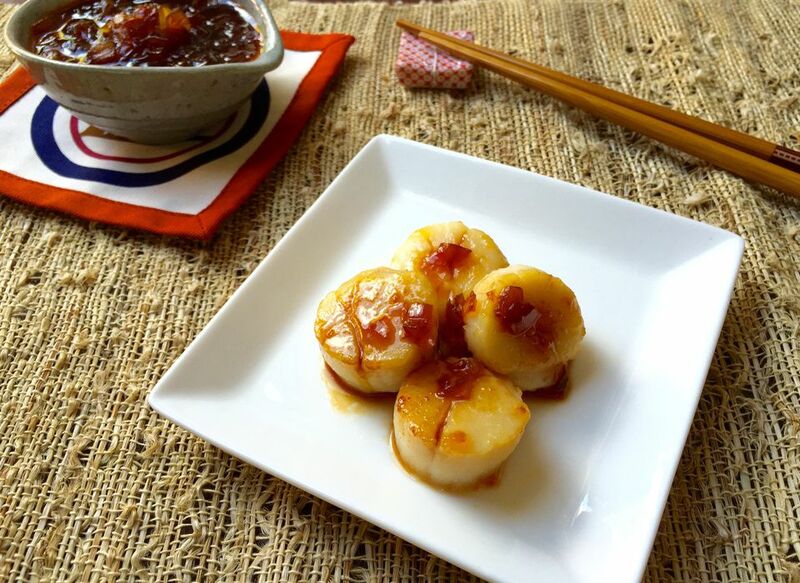 Scallops, much like other seafood, is a staple in Japanese cuisine and it is often incorporated into everyday meals. While the most common seafood is fish, this dish of pan seared scallops is a great addition to any Japanese meal. This recipe uses a spicy Japanese onion sauce. Try making it in advance, and then use it on more than just these scallops. The sauce is easy to prepare and can be made in a relatively short amount of time. It's a mixture of sauteed sweet onions, soy sauce, sake, chili garlic paste, and oyster sauce. A hint of sugar balances out the salt from the soy sauce and oyster sauce. In a medium cast iron pan, heat olive oil over medium-high heat. If you're looking for a slightly rich flavor, add a small pat of unsalted butter to the olive oil. When the oil is hot, add scallops. If the scallops are on the small side, sear them for about two minutes until browned. Don't turn over the scallops until the first side is browned. As much as possible, try and leave the scallops on their own for those two minutes. After the scallops are turned over, brown them for another two minutes. For larger scallops, this might take three to four minutes instead. Note, if the scallops are sashimi grade you might prefer to sear the outside and leave the inside rare. Plate the seared scallops on a small appetizer plate and drizzle the spicy onion sauce over the scallops.